English Speaking Course in Hindi ! and this course is helpful to learn English . English Speaking Course is very new and advanced application to learn English Speaking Fluently. Most of the time we face many kind of problem due to poor english speaking like to get a job etc. Must download app for anyone who wants to speak fluent English. 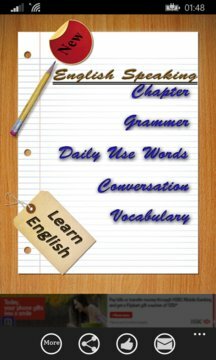 Welcome to this Unique English Speaking Program app which will help you to speak fluent english within 30 days. It is very necessary to know how to speak English in today's world. If you want to succeed in life you need to know how to speak English with confidence. English is a West Germanic language that was first spoken in early medieval England and is now a global lingua franca. A working knowledge of English is perceived as being valuable; for example, English is very dominant in the world of computing. Now a days without english it is very difficult for us to get placed in MNCs .So download this app for better understanding of how to speak in english. In this application you will easily and fastly understand the basic term of enlgish and you will start speaking english fluently. The most effective way of speaking Fluent English is . 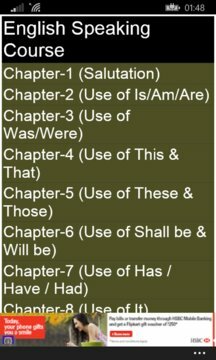 . .
And the application is mainly focused on the day today examples of english so which will be easy to understand english fastly. This English application is absolutely Free! This app is offline so you dont need to have internet connection. You will not find any better English Application than this anywhere.